My name is Michele and I am a Regina Local artist! I was born and raised in Regina and now raising my own child in this beautiful city! I create original and custom art pieces using primarily water colour and acrylic paints…although I have dabbled in other mediums. I don’t have any specific focus on what I paint, as I go by my mood and what I find beautiful. Sometimes it a simple painting of a leaf to a detailed scenic painting. I have also recently ventured into hosting painting events for groups of people in their homes teaching skills on how to paint using acrylic paints. As mentioned my focus is water color and acrylic. 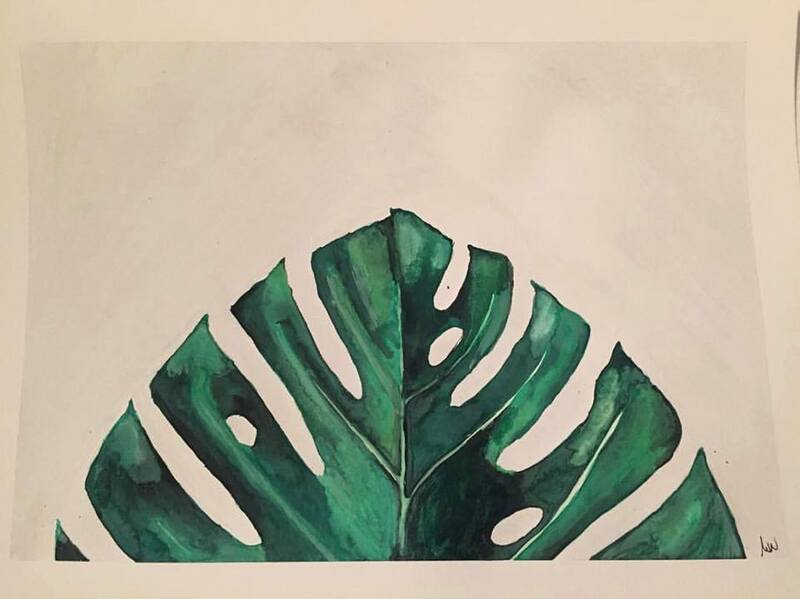 I have spent the last year and a half learning water color and utilizing it in my pieces, but I learned how to paint using acrylic paints. I have dabbled in some other materials such as charcoal, oil paints, and simple pencil drawings! I also primarily paint on canvas or paper, but I have drawn on shoes, skateboards, drumsticks and anything else that will hold color. I love new challenges so I am always looking for new materials to try! I create because I love it! I love mixing colors and watching an image come to life with shading and details. I also have a constant imaginative mind and am usually thinking up new ideas on a day to day basis of what I could do! So much has changed since I first started painting and drawing. I’ve painted my entire life so much of it has been improving my skills, but also my view point on art. How much time do you spend on your art practice? Working full time and being a full-time mom doesn’t leave much time for my creative side, but no matter how busy I am, I can always find time. It’s often late at night after my daughter has gone to bed I’ll be up till midnight or later painting. Now that my daughter is getting older and enjoys painting as much as I do we often will work on our paintings together on weekends or evenings. Of course not! I would love to have my art everywhere! I don’t foresee myself ever NOT painting or creating new things. Two things stick out the most. The first is the excitement I get when someone loves one of my pieces and takes it home. To me knowing that one of my art pieces will be in their home, its rewarding to know people truly enjoy it! Secondly, its now watching my daughter grow up and seeing her love of painting and creating grow. I love watching her follow along with me while painting and her learning new techniques. How is your art unique from others? I think I am unique as I am not afraid to use big bold colors along with simplicity in my work. I also have never liked following the boundaries of art and don’t believe there are boundaries. I have never had any post-secondary training and don’t believe that its needed to be an artist. You can learn about art and techniques in so many other ways! I’ve always said Art can be anything you want it to be, and on anything you want! I have hosted some events as well and I always encourage any level of artists to continue painting no matter what. Art isn’t perfect and no matter what you just need to have fun with it! Creative joy to me, means just being happy with what I create. I am putting myself and my emotions on a piece of paper or canvas, and showing the world who I am.